​Get to know our progress! Get to know our progress! At Ability Pharma we are very proud of all the progress we have done and we are continuously doing in the development of ABTL0812. Today we would like to explain our evolution since the last financing round we had in 2016. Only 2 years have gone by but our progress has been enormous. In 2016 our last financing round was carried out and with this we achieved very important milestones such as the license agreement with SciClone Pharmaceuticals to develop, promote, market, distribute and sell ABTL0812 in China, as well as in Hong Kong, Macao, Taiwan and Vietnam. In addition, the prestigious medical journal Clinical Cancer Research published the novel mechanism of action of our drug ABTL0812 in its publication. Regarding the clinical development, in December 2016, the phase 1/2b clinical trial started at the Institut Vall d'Hebron d’Oncología (VHIO, Barcelona) and the Institut Català d’Oncología (ICO, Hospitalet, Badalona y Girona). The study included later the INCLIVA (Valencia), the Institut Gustave Roussy (Paris), the Centre Léon-Bérard (Lyon), the Institut Paoli-Calmettes (Marselle) and the Hospital Universitario Virgen del Rocío (Seville). Last year, was an important year for our company and our drug, achieving significant milestones. The US-FDA approved the phase 1/2a clinical trial with ABTL0812, in patients with endometrial cancer or squamous non-small cell lung cancer, in combination with paclitaxel and carboplatin as first-line therapy line, which validated the ongoing clinical trial in Europe. In August of that year, the EMA granted the ODD (Orphan Drug Designation) to ABTL0812 for pancreatic cancer, also previously granted by the FDA in November 2016. In December 2017 we presented the amendment to the IND in the FDA to conduct an open phase 1/2b study to evaluate the efficacy and safety of ABTL0812 in combination with gemcitabine and nab-paclitaxel in patients with advanced metastatic pancreatic cancer as first-line therapy and as maintenance after chemotherapy. In January of 2018, only one month after its presentation, the protocol for the phase 1/2 clinical trial with ABTL0812 in patients with pancreatic cancer was approved by the FDA. 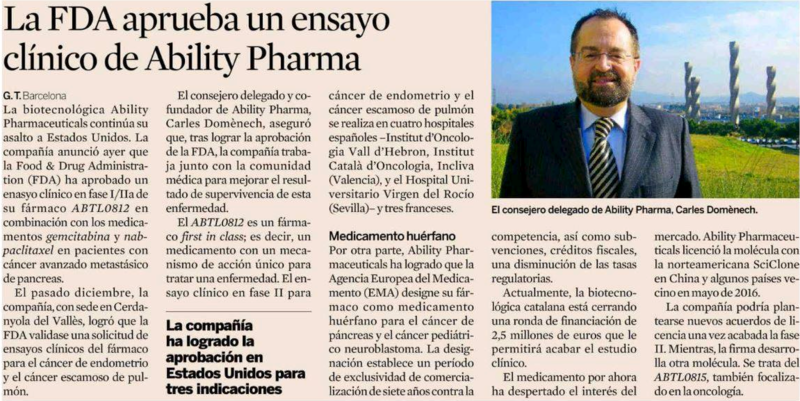 We are currently submerged in phase 2 clinical trial to treat endometrial cancer and lung cancer in 80 patients in centers of Spain and France. Our future is ambitious, we want to stop cancer from being a deadly disease and turn it into a chronic illness. To do this, we have just started a new fundraising campaign through a crowdfunding. The primary objective with our crowdfunding campaign is to achieve 1 million euros in order to complete the phase 1/2 study with the development of additional biomarkers and the development of a new formulation. A successful outcome of the second trial would put us in a strong position to negotiate a licensing agreement to a big pharma or would allow an IPO in a stock market.